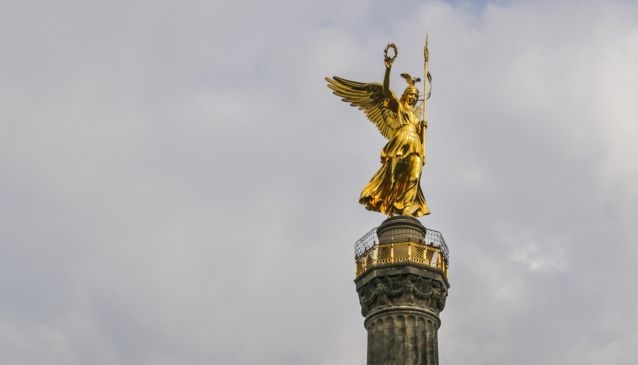 The Siegessäule holds a very special place in Berlin's history, not just in the 19th century but also much more recently, when American presidential candidate Barack Obama addressed a crowd of 200,000 people in front of it in 2008. Designed by Heinrich Strack for Emperor Wilhelm I and revealed to the world in 1873, the neoclassical style statue stands 67 metres high. Friedrich Drake later added a tall golden statue to the top to represent the adored Goddess Victoria. Today, the monument sits in the middle of a large and busy roundabout in Tiergarten, relocated there in 1939 following Nazi plans to remodel the city of Berlin. You can climb to the top - 270 steps or so - and witness incredible views of Berlin's city landscape. Visitors love the ornately sculpted frieze and the seemingly never-ending spiral staircase. Just don't try to cross the roundabout to get there: use the pedestrian underpass!